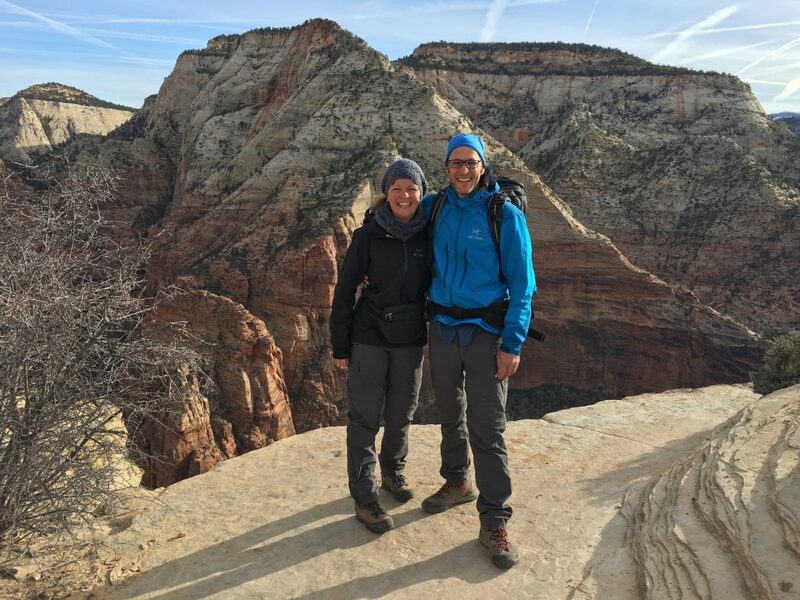 After Snow Canyon, we drove to the Zion National Park – the first park of our Grand Circle tour. If you never heard of the Grand Circle, don’t worry, I had no idea either. ? Okay, okay, we might add some more detours ?. 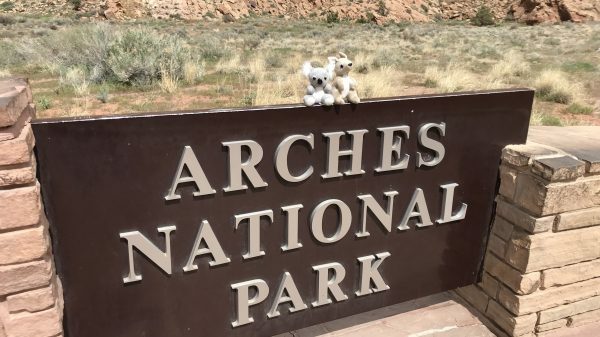 As we visited the Snow Canyon National Park and also lost one hour due to moving into another time zone, we arrived near the Zion National Park in the afternoon. Given that Zion is very popular, we didn’t even try to fetch one of the walk-up camping sites. Instead we stayed at a free BLM Campsite (BLM = Bureau of Land Management). Because early birds catch a campsite, we only had a quick coffee in the morning and went straight to the Watchman Campground in the National Park. 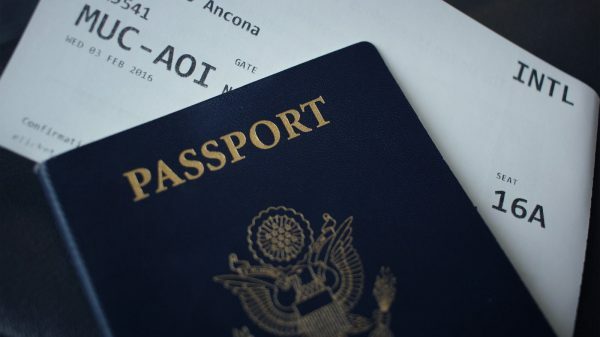 Although we couldn’t book a spot in advance, we had seen several walk-up spots available. Unfortunately, we learned at the entrance, that they are doing some maintenance work and need those first-come-first-serve spots for others who actually have booked in advance on the loop that is now closed for maintenance. We were quite surprised, that no spot was available that early in the morning and despite being in the beginning of the low season. We had heard from our German camp-neighbours the day before, that most reservable campsites were booked out already 6 months in advance. But we had hoped that at least some first-come-first-serve spots would still be available. Anyway – next try: Zion Canyon Campground and RV Resort, which is in the town close to the entry of the park. We were lucky; they had one spot left. 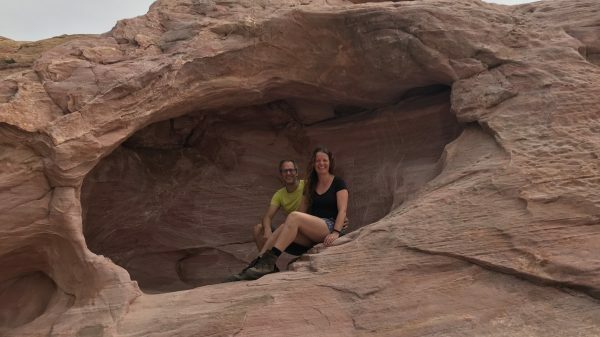 So we checked-in for two nights – and paid double than we would have at Watchman Campground. After buying some groceries, we went to the visitor centre to get some information. 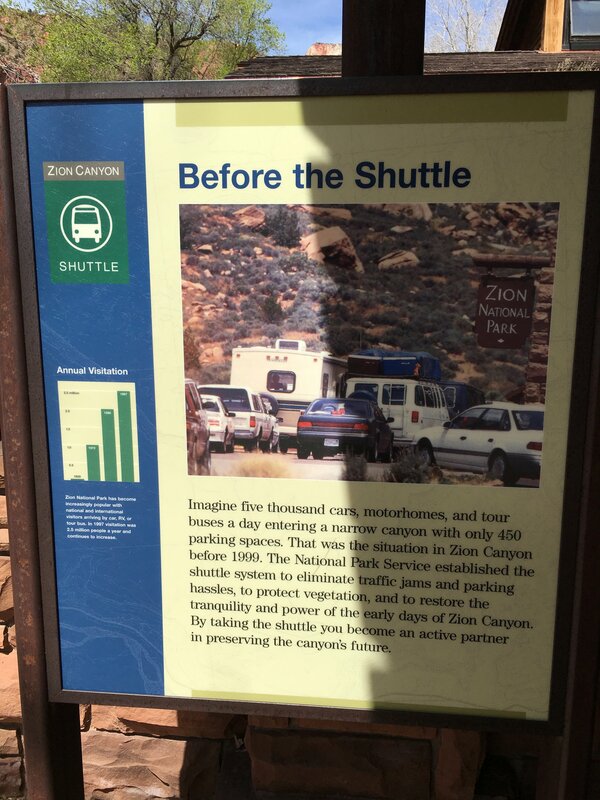 Zion National Park has established a shuttle bus to protect the park and avoid traffic jams. Given it’s popularity – in 2017, more than 4.5 million people visited Zion – this was probably a wise decision. We took the shuttle bus right away for the scenic tour to get an overview of the park. Afterwards we went back to our campground to take care of our laundry. Finally, we found a dryer that really dried our undies given the first try. On the campgrounds in New Zealand and Australia, we often needed several rounds. After the dryer finished and the rest of our clothes was drying in the sun, we walked back into the national park to hike the Watchman trail (moderate, 4.3 km). Angels Landing is a strenuous hike, 8.7 km with 453 m elevation change, and supposed to take about 4 hours. The visitor information states that it’s not for young children or anyone fearful of hights, because the last section goes along a steep, narrow ridge to the summit. Needless to say that Marcel had this hike on his wishlist. I was not very sure about doing this and read a bit about it. I had read this post and thought that although the Observation Point hike is longer (22.5 km, 316 m elevation change, 8 hours), maybe it would be a better option. It is not as narrow, you don’t walk along chains and you actually look down on the Angels Landing viewpoint. However, the trail was closed due to rock fall. Despite it being such a dangerous and scary hike, it is very popular, so we decided to take the very first shuttle bus at 7:00. The guy at the visitor centre recommended to be there a bit earlier, as there will still be a long queue waiting for the first bus. So we got up at 5:30 and walked to the bus stop an hour later. It worked fine and we started our hike at 7:30. A sign reminds hikers that people actually died falling from the cliffs. Well, if that’s not reassuring ?. The first part of the hike up to Scout Lookout was quite exhausting… it goes up and up, but as usual, it also had nice views. All the way up to the lookout, I was quite sure that this is where I’d wait for Marcel to return; I even brought my Kindle with me. But when we arrived, it seemed a bit boring. And the chains looked very stable… and because we had been on the first bus, there were not many people up there yet. So I decided, to do it. And it was actually REALLY fun! Who would have thought?? When it gets slippery or steep, I usually feel very uncomfortable. But as it turned out, using chains like here or trees like the ones at Serpentine Dam (see post here) as support is a lot of fun – even for me. And no – we were not done yet. You can see hikers behind us. This is where we came from… Seriously, who comes up with the idea to create such a trail? ? I was super super happy and also a bit proud that I actually did it! It was so much fun and the view was just spectacular! Back at Scout Lookout, we continued our hike a bit further along the West Rim trail. When we came back, to Scout Lookout, the place was pretty packed and the path to Angels Landing was super crowded. If it had been like this in the morning, with that much two-way traffic, I wouldn’t have done it. I am glad that we started that early and could do the hike without stress.